Since 1967, Capt. Anderson's has innovated many of the Gulf Coast's classic dishes and has won the loyalty of millions of customers and friends. It is a local tradition to dine early at Capt. Anderson's Restaurant in Panama City Beach, and watch the fishing fleets unload their catch. Capt. Anderson's restaurant is one of those rare "family" restaurants that not only survives, but strengthens and improves through the years. 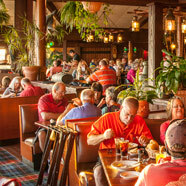 The landmark waterfront restaurant has witnessed remarkable growth without loss of quality. The restaurant has grown to 725 seats and, six nights a week, serves over 250,000 guests during its 8 month season. Founders, Jimmy and Johnny Patronis set high standards of hard work and consistency for the younger Patronis generations, and they still pull their shifts at the busy restaurant, stopping by to welcome old friends and loyal customers… occasionally bussing a table or taking a special order. Their passion for the business is undoubtedly the root of Capt. Anderson’s success. Named among America’s Top 50 restaurants, recipient of the "Best Seafood Restaurant" award from Southern Living and Wine Spectator's "Award of Excellence," Capt. 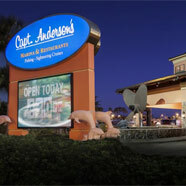 Anderson’s won Florida Trend’s Golden Spoon Award for 15 years before being inducted into the Restaurant Hall of Fame in 2005. The Hall of Fame is the highest honor Florida Trend can bestow upon a Florida restaurant. Year ‘round, the Patronis family works with fishermen, oystermen and others who make their living harvesting the Gulf and Bay waters, to preserve the natural oyster beds of Apalachicola Bay... to build artificial reefs... and protect the fragile coastal ecology. Preserving and replenishing the rich natural bounty of the Gulf Coast is part of the Capt. 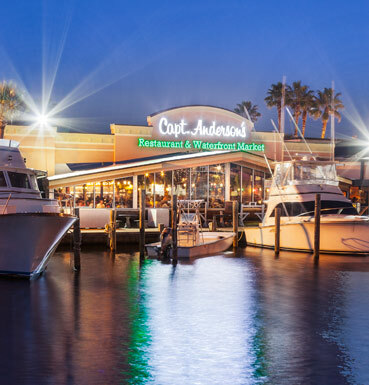 Anderson’s legacy, one of the most important reasons this landmark restaurant is known for serving more fresh local seafood than any other restaurant in Florida.